Do you knit, sew or practice some other form of fine craftsmanship? Wish you could sell your wares but don't want to go to the trouble of opening up your own Web store? 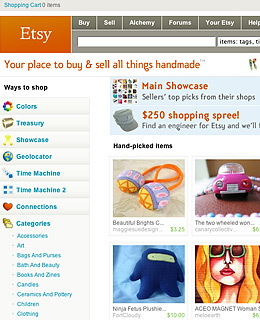 Sell them on Etsy, a thriving marketplace for handmade items of all sorts, including clothing, jewelry and other personal items, home décor and housewares. The item descriptions will note how many are left in stock. Often there's only one leftthese are homespun operationsbut many sellers will take custom orders ("If you like the style of this bag but would like a different color scheme, or have a favorite material, contact me..."). There are several different ways to shop: by category (crochet, ceramics, woodworking) or by color, or visit a particular shop, which will be listed in the directory by the seller's username. HomeGrownMarket.coma similar site where we spotted some nice handmade fabric belts, bracelets and baby quiltsruns a forum where buyers can submit custom order requests and sellers can bid for the job.